If you’re searching for professional landscaping in Tampa, look no further than Evergreen Total Landscape. Customers in the Tampa Bay area and beyond have trusted our services since 1983. From commercial landscape maintenance to Christmas light decoration, irrigation maintenance to landscape design and installation, Evergreen has the knowledge and the resources to perform just about every landscaping task. Along with keeping your property in pristine aesthetic condition, Evergreen has a certified pest control operator who can protect your land from harmful critters. Using a state-of-the-art organism that eliminates bugs and destroys any eggs, Evergreen will keep critters away without having to constantly spray and re-spray harmful pesticides. We also use organic fertilizers when installing and maintaining landscapes that drives away insects at virtually no cost to the environment. 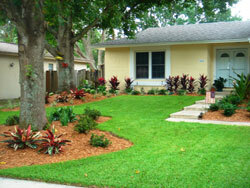 For more information about our landscaping services in Tampa, please call or e-mail Evergreen Total Landscape today. We can also serve customers in Lakeland, Clearwater, St Petersburg, and surrounding cities.